PTSD is a complex psychiatric disorder with common comorbidities that can be difficult to treat. Conventional evidence-based therapies include trauma-focused cognitive behavioral therapy and certain antidepressants, but these treatments may not be tolerated or preferred for a variety of reasons, or they may only be partially effective. This lesson familiarizes the clinician with a variety of CAM treatment options for PTSD as well as the rapidly growing use of transcranial magnetic stimulation (TMS) for PTSD. We review the basics of various meditation practices, animal-assisted therapy, acupuncture, and TMS and potential ways they can be incorporated into practice. We also briefly discuss what is known about the use of cannabinoids for PTSD. Meditation appears to activate this brain region, which is also a target region for TMS? Ritchie EC. Three buckets for treatment of PTSD [Web log post]. 2016, June 07. 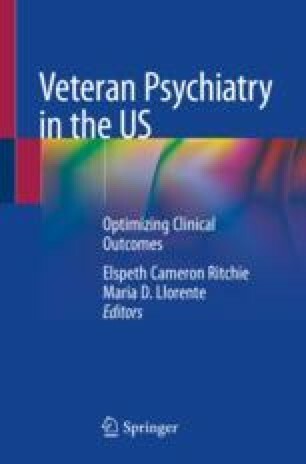 Retrieved August 18, 2016, from https://www.psychiatry.org/news-room/apa-blogs/apa-blog/2016/06/three-buckets-for-treatment-of-ptsd. NCCIH Homepage. 2016, August 4. Retrieved from https://nccih.nih.gov/health/integrative-health. Office of Research & Development. 2016, April 26. Retrieved August 18, 2016, from http://www.research.va.gov/topics/cam.cfm. Service Animals. 2011, July 12. Retrieved August 07, 2016, from https://www.ada.gov/service_animals_2010.htm. Avery T, Blasey C, Rosen C, Bayley P. Psychological flexibility and set-shifting among veterans participating in a yoga program: a pilot study. Mil Med. 2018. https://doi.org/10.1093/milmed/usy045. Lynch JH, Mulvaney SW, Kim EH, de Leeuw JB, Schroeder MJ, Kane SF. Effect of stellate ganglion block on specific symptom clusters for treatment of post-traumatic stress disorder. Mil Med. 2016;181(9):1135–41. https://doi.org/10.7205/MILMED-D-15-00518. PubMed PMID: 27612365. Hanling SR, Hickey A, Lesnik I, Hackworth RJ, Stedje-Larsen E, Drastal CA, McLay RN. Stellate ganglion block for the treatment of posttraumatic stress disorder: a randomized, double-blind, controlled trial. Reg Anesth Pain Med. 2016;41(4):494–500. https://doi.org/10.1097/AAP.0000000000000402. PubMed PMID: 27187898. State Medical Marijuana Laws. National Conference of State Legislatures, 27 June 2018, www.ncsl.org/research/health/state-medical-marijuana-laws.aspx.